I Like To Party [G6071] - $10.00 : Yarn Tree, Your wholesale source for cross stitch supplies. Cross stitch pattern Amy Bruecken Designs. I think these sheep might have counted too many sheep! 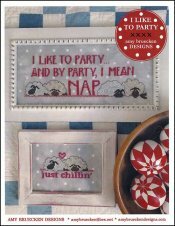 "I like to party and by party, I mean nap," is stitched in the middle of the design with sleeping sheep next to the saying. Also included is a design for the two sheep "just chillin'." Clearly, there is no better party than a nap! Stitch counts: Nap is 162 x 58 & Just Chillin' is 68 x 35.